During this story of Princess Nadia’s fun-filled adventure, Princess Nadia learns the meaning of true friendship. While looking for a friend on an African safari, she discovers that she’s had one by her side all along. Talented Books is proud to announce our first new title: Will You Play With Me? The Adventures of Princess Nadia. Now available on Amazon.com and BarnesandNoble.com. Now Available on Kindle too!!! During this story of Princess Nadia’s fun-filled adventure, Princess Nadia learns the meaning of true friendship. While searching for a friend on an African safari, she discovers that she’s had one by her side all along. This story is intelligent and full of adventure! Nadia is the New African American Princess! “My kids loved the pictures”. “It’s great to see a strong and smart African American female character”. Princess Nadia and the Search for the Missing Treasure. Princess Nadia continues her adventure on the high seas by searching for the treasure of Captain James Joker Jib. One surprise leads to another as Princess Nadia and her team learns the real truth of the missing treasure. 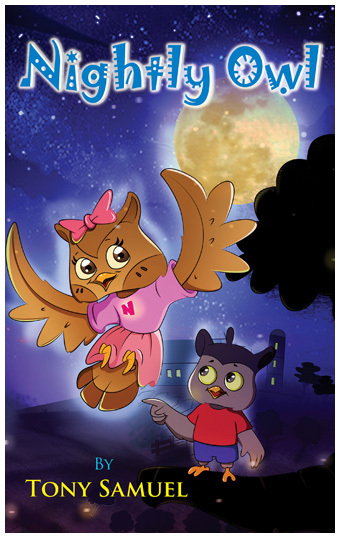 “Nightly Owl” is the exclusive and official third release from elite children publisher Talented Books. Independent children’s book publisher Talented Books is the premier destination for innovative content and ideas. The story of Nightly Owl will inspire children of all ages and backgrounds. Nightly Owl go out every night to get the best food for little brother, while the early birds are still asleep. She is a smart and strong big sister. In this story, the early birds do not get the best worms…they get the left overs! Author Tony Samuel was inspired to write this story to entertain not only his daughter NADIA, but to entertain children from all backgrounds. Nightly Owl is now available worldwide! Also, get the other two critically acclaimed releases by Talented Books today! All Talented Books releases are currently available worldwide @Amazon.com, the Kindle store and at BarnesandNoble.com.